Small, 700 Ml. Dispenser Is Ideal For Tight Spaces. Large Sight Window, Skylight And Crystal-Clear Refill Bottles (Sold Separately) Make It Easy To Check Fill Status. Adx-7 Manual Foam Soap Dispenser Converts To A Locking Dispenser At Any Time By Simply Removing The Key From Inside The Dispenser. Patent-Pending, Controlled-Collapse Refill Bottles Hold Their Shape As They Empty For A More Attractive Overall Appearance. Removable Pump Makes Recycling Easy. Sanitary-Sealed Refills (Sold Separately) Are Made Of Durable, Recyclable Pet Material, Using 30 Percent Less Plastic Than Rigid Hdpe Bottles. Dispenser Is Fully Ada-Compliant..
Small, 700 Ml. Dispenser Is Ideal For Tight Spaces. Large Sight Window, Skylight And Crystal-Clear Refill Bottles (Sold Separately) Make It Easy To Check Fill Status. 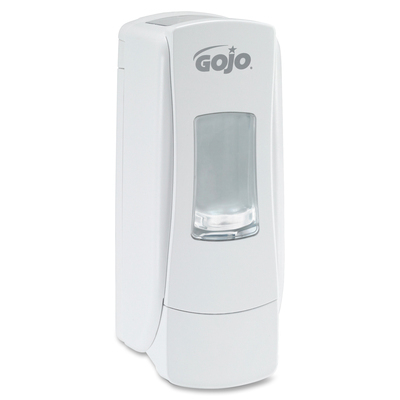 Adx-7 Manual Foam Soap Dispenser Converts To A Locking Dispenser At Any Time By Simply Removing The Key From Inside The Dispenser. Patent-Pending, Controlled-Collapse Refill Bottles Hold Their Shape As They Empty For A More Attractive Overall Appearance. Removable Pump Makes Recycling Easy. Sanitary-Sealed Refills (Sold Separately) Are Made Of Durable, Recyclable Pet Material, Using 30 Percent Less Plastic Than Rigid Hdpe Bottles. Dispenser Is Fully Ada-Compliant.